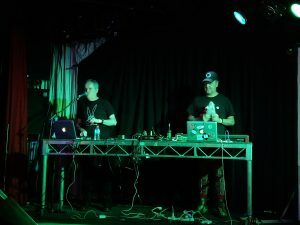 Two electronic Australian bands that have retained a solid, if moderate, support-based over the years are Snog and Severed Heads, each managing a degree of popularity with their minor hits ‘Corporate Slave’ and ‘Dead Eyes Opened’ respectively. It was therefore quite a special opportunity to have them playing together at the Corner Hotel on November 5 for — and this must be emphasised — a mere $20 cover charge. Seriously, that’s a ridiculously cheap price, they could have doubled that it still would have been a bargain. 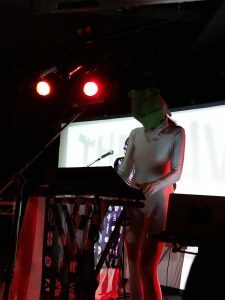 Snog came on first, and somewhat incognito, with the introduction performed by front members dressed in bodystockings and wearing Pepe the Frog heads. It led, of course, to the almost inevitable pun, “we came here to see Snog, not Frog!”; yes, complete genius that comedian. 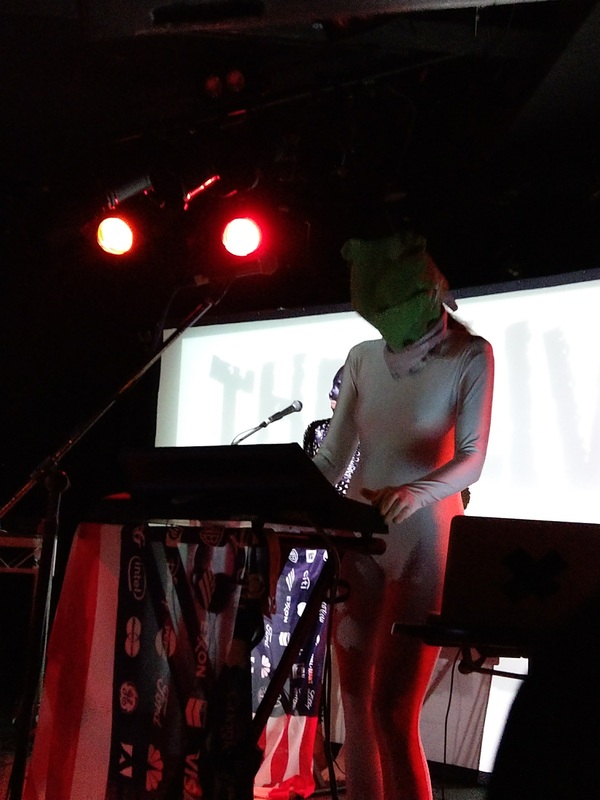 The frogs were soon supported by a certain lead vocalist in a gold suit and a Donald Trump mask. With masks removed the band moved on to their set proper, playing a lot of their favourites to a thoroughly appreciative crown. Their catalogue is utterly enormous, but they catered for fans old and new, including a very good rendition of ‘Spermy Man’ early in the piece, along with their popular ‘Born to Be Mild’, along with more recent releases such as ‘A Clockwork Man’ and ‘Rich Kuntz’, the latter particularly well performed. Never let it be said that Snog are subtle in their critique of capitalism and disparaties in wealth. Naturally enough, and as expected, the grand conclusion was ‘Corporate Slave’, a fine way to conclude a set which ran a little over an hour. With the audience thoroughly pumped from the tight set performed by Snog with their mostly allegro tempo, Severed Heads with their more experimental and adagio introduction were quite a juxtaposition. It was a pleasant surprise to see them again, especially after the announcement that their 2011 gig really was going to their last show. Still, there was no such announcement this time, although there was a lot more audience interaction than the Heads are normally notoriously lacking in. Their antics, for example, with their toy stuffed rats provided some mirth for those paying attention — which itself was easy to miss (as was the time when their stage table almost collapsed). Severed Heads continue to be the sort of band that metaphorically and literally play to the side, with their superb video productions at least important as their music, taking centre stage. Changing from their many more ambient pieces (e.g., selections from many versions of ‘Over Barbara Island’) to their electronica, Severed Heads always often had a bit of a vehicle-based theme in their work and this was particularly evident in the night with ‘Petrol’ and ‘Lamborghini’. A great highlight for your reviewer was the superb track ‘Choose Evil’, now with a modified video of the famous dancing and mariachi skeletons. Of special note was a great performances of ‘First Steps’ and especially ‘Heart of the Party’. 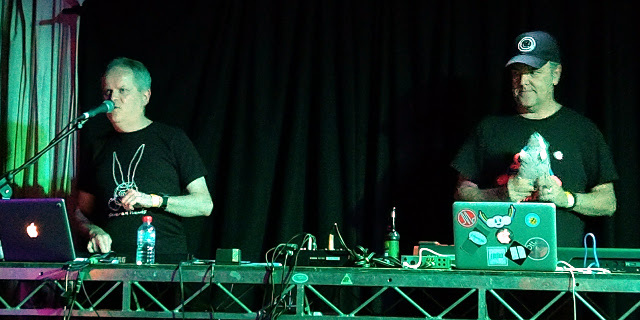 Like Snog, Severed Heads finished their main set, as expected, with their most well known track, ‘Dead Eyes Opened’, in a magnificently extended mix. Allegedly the headline act, Severed Heads and Snog almost certainly respect each other as equals, and the Severed Heads set was not noticeably longer than that performed to the so-called support act. Overall this was a fascinating night to see two such bands perform alongside each other and at the incredibly low cover-charge. Certainly a concert for their fans, with the only regret being the length and location. Now there is absolutely nothing wrong with either two sets of an hour plus, or for that matter The Corner Hotel as such (especially given the significant improvements in sound quality). However there was something quite special about this particular show and, as mentioned in the introduction, they certainly could have doubled, tripled, or even quadrupled the priced, selected a far more salubrious venue (The Corner is just fine for punk-era grunginess), and played for hours on end. And if all this sounds like a strange “complaint”, it is; play more music, show more videos, and take my money. Reviews: Phase Fatale, Christian Fitness (2017). Proto Idiot: Leisure Opportunity (2017).